The pioneering Florida-based company celebrates a monumental accomplishment with a party honoring its first client and a year’s worth of celebrations. 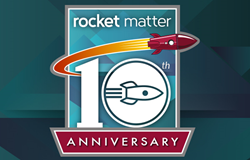 The first-ever cloud-based legal practice management software, Rocket Matter, began celebrating its 10th anniversary with a kickoff party this past Friday. The company will continue to honor this seminal achievement over the course of the next year with a road show, parties, special editions of their highly-regarded content, and other surprises. For a tech startup, achieving ten years of business is a rarely-achieved accomplishment. What’s particularly noteworthy is that Rocket Matter was not only the first product of its kind on the market, but its innovations continue to lead the field. In 2007, the Florida-based company had to prove out the cloud legal practice management market. In particular, the company overcame objections of consultants with a vested interest in client/server software who sowed fear, uncertainty, and doubts about the use of the cloud for law firms. The first ever Rocket Matter client was Peter Sosin, a lawyer from the company’s home town in Boca Raton, FL. His firm began using the software before the name Rocket Matter was even chosen. Sosin often still refers to Rocket Matter as “The Product,” which was the working title of the software back in November 2007. After Sosin started tracking time with Rocket Matter for a while, he wanted to know how to generate invoices. Invoice generation was not originally part of Rocket Matter, so Port pulled an all-nighter and coded an invoicing package. Sosin has since gone solo, and he continues using Rocket Matter to this day. Rocket Matter has the most powerful, easy-to-use time and billing software in the industry. Also, when law firms want to make more money, go paperless, or increase confidence in their trust accounting, Rocket Matter helps them achieve those goals. With award-winning customer service based in the United States, it’s no wonder thousands of law firms swear by Rocket Matter.